This chapter provides a comprehensive review of the architectures, algorithms, and protocols in the topic of resource management in IEEE 802.11-based wireless networks such as wireless LANs, heterogeneous wired/wireless networks, mobile ad hoc networks, and wireless mesh networks. The focus is given to the approaches for bandwidth allocation in different networks as well as how these strategies are incorporated in each specific protocol. Although the issues of resource management and quality of service support in different networks highly depend on the specific network architectures and mobility patterns, existing works in the literature have shown that the key issue in 802.11 networks is how to coordinate the contention based channel access by considering channel rates, network topology, interference, and mobility. With successful resource allocation schemes, sufficient quality of services can be supported to maximize user experiences with multimedia applications such as voice and video in wireless networks. Next generation wireless networks will require significant flexibility on deployment so that the objective of providing seamless service to users anywhere at any time can be achieved. Having been successfully used as the ubiquitous last-mile technology in the present days, IEEE 802.11 has become the de-facto standard for providing wireless access in applications such as campus wireless LANs, wireless hotspots in hotels and airports, and military battlefields. The data rates guaranteed by the standard reach as high as 54Mbps and 11Mbps for 802.11a and 802.11b, and current research is investigating enhanced PHY layers and data aggregation techniques in order to enhance the capacity of the WLANs channels. 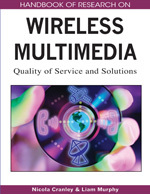 With this availability of broadband capability in IEEE 802.11 networks, it is a natural demand that appropriate quality of service (QoS) strategies are devised so that wireless users can access multimedia data such as voice, video, and 3D animation and experience satisfactory entertainment. Depending on the actual applications and types of networks, the issues of QoS can be quite different. For instance, in single-hop wireless LANs, it is desirable to provide sufficient quality of service for real-time flows not only within each individual wireless LAN, but also among different wireless LANs when users roam in the network. Furthermore, it is not unusual that mobile users access/exchange information in wired networks. In this case, end-to-end QoS is a must in order to better support multimedia applications such as voice over IP and online video. On the other hand, in self-organizing multi-hop mobile ad hoc networks (MANETs), it is imperative that sufficient and reliable QoS is provided from the source node to the destination node, even when significant mobility and dramatic topology change is present. In addition, the concept of multi-hop ad hoc networks can be extended to wireless mesh networks where static wireless mesh routers are installed on the top of buildings to form what is called “mesh backbone.” Existing wireless access networks can easily reach Internet via those wireless mesh routers. Since mesh routers can be equipped with multiple radios or multiple channels, the interference among different routers is reduced and thus the capacity of the mesh backbone is significantly increased. How to provide appropriate QoS by incorporating the multiple radio/channel capability is still a challenging issue. Basically, there are two fundamental QoS issues in IEEE 802.11 based wireless networks. First, there is no QoS protocol in standard 802.11 MAC layer. Although IEEE 802.11e was proposed to prioritize the media access by stations of different priorities, how to improve the performance and provide QoS guarantee in 802.11e EDCF and HCF remains a challenge. Secondly, in multi-hop single channel wireless ad hoc networks, different links on the paths of the same flow may compete for the channel access and thus interfere with each other. In this case, it is difficult to provide high throughput. How to deal with this type of multi-hop interference and estimate the available bandwidth along a certain route is critically important for sufficient quality of service support.